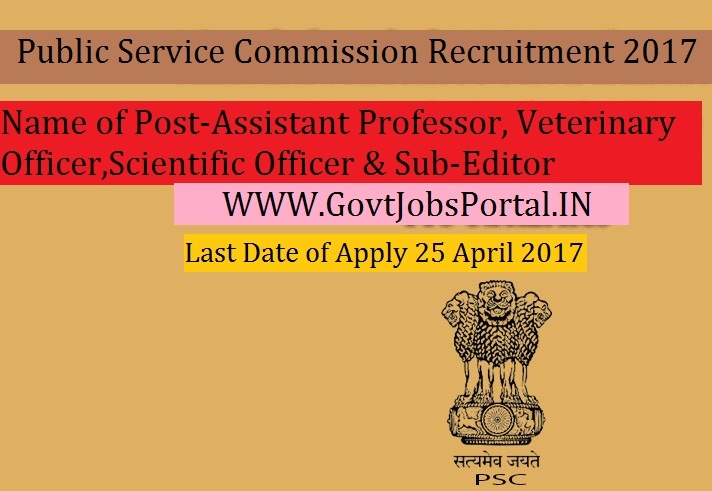 Public Service Commission is going to recruit fresher candidates in India for Assistant Professor, Veterinary Officer, Scientific Officer , Assistant Controller , Sub-Editor Posts. So, those candidates who are willing to work with this organization they May apply for this post. Last Date of Apply 25-April-2017. Total numbers of vacancies are 58 Posts. Only those candidates are eligible who have passed Degree in any discipline from a recognized University or its equivalent. Indian citizen having age in between 18 to 40 years can apply for this Public Service Commission Recruitment 2017.